Ceibass Venture Partners – We’re thankful For Business Owners in the Lawn and Landscape Industry. 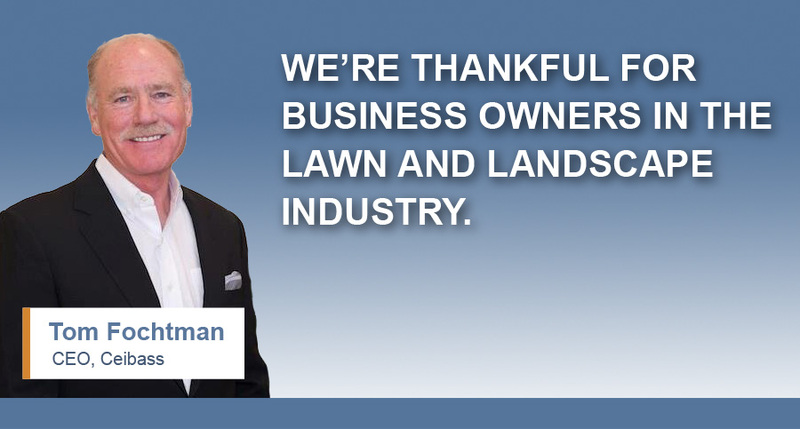 We’re thankful For Business Owners in the Lawn and Landscape Industry. We are thankful that you want to be a business owner. Not everyone is cut out for it. We are thankful for your resilient attitude when it comes to the relentless accountability that you face. We are thankful that you have the stamina to face each and every issue that keeps you up at night. Head on. We are thankful that you love to compete and that you want to win each and every transaction, and hold on to the best customers for life. We are thankful that you want to be wealthy, that you seek top margins and that you are willing to put the best team on the field that you can…all the time. We are thankful that you love working outside. Nothing beats the smell of freshly cut grass. We are thankful that you are humble and not arrogant, and seek out top professionals, like the experts at Ceibass, to help you produce superior value and competitive advantage. We are thankful for your willingness to learn, and for your commitment to lifelong learning, you are an inspiration to us. We are thankful for your sense of duty and discipline when it comes to running a successful enterprise. There are no time outs. And the competition is always lurking. We are thankful for you resisting the pressures to cut corners on your journey to build a strong and lasting company. There are no short cuts to success.